Horta is one of the great ocean crossroads of the world. Ever since people started voyaging in small boats, they have been coming here. In fact, it turns out that Largo’s name has been painted over. 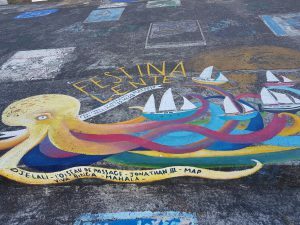 Obviously, Samsara had to make her mark – although, since she has six Atlantic crossings to her name that I happen to know about, it is most likely some are listed somewhere here already – if only I could find them. Since publishing my YouTube video just two weeks ago, I have had five people sign up for regular supplies of the health supplement which I credit with keeping me going into my eight decade – and all without any of the sort of ailments with usually afflict people of my age. … with lots of room to add the dates of future visits. Here’s a tip, if you ever want to do this: Don’t buy cheap paint brushes. I got mine from B&Q before I left home and by the time I had finished, my painting looked like something out of the reception class at my children’s old primary school. This meant I had to go back, time and again, with better brushes, touching up the mess. It drew a certain amount of attention from those passers-by whose attention I had intended to attract in the first place – it’s just that I wished they would wait until I had finished. Trying not to roll my eyes, I pointed to many thousands of other paintings stretching in both directions and explained patiently that sailors had been painting on these walls for at least 50 years and I was sure that if the authorities objected, they would have done so before now. 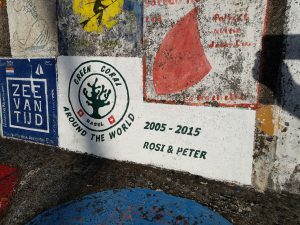 It was only afterwards that I wondered if anybody had asked permission to paint on the Berlin wall. A French woman came by and wanted to photograph me with my finished work. She said she would send me the photo. It was only after this, when I had begun to think about a photo that I took a really close look at what I had done and realised I had left the first “e” out of “lifestyle”. So that was it, wasn’t it? I got out the big brush and painted over the whole thing. Now I’m going to have to do it all again tomorrow. Feeling as if I needed some sort of restorative, I took myself off to the Café Sport while the paint dried. 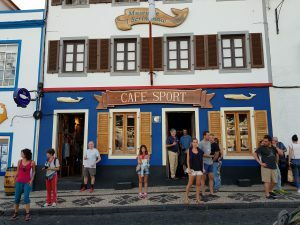 You can look up the Café Sport in Horta – it’s an institution. Now in the hands of the grandson of its founder and having grown from one café to an entire street with a restaurant, a whale-watching business, a clothes shop selling all things “Café Sport”, a scrimshaw museum (art on whalebone), not to mention an ice cream stall, a beer terrace and even its own gin. Café Sport is the definitive lesson on how to build a successful business from a single idea. Sure enough, I took my beer across the road to take yet another picture of sunset on Pico’s volcano (every time you see it, there seems to be something more dramatic about the way the light catches the clouds). While doing so I fell into conversation with a couple from Quebec who had sailed a boat even smaller than mine from New York. We discussed refrigeration and baking bread, lightning protection and astro-navigation – and it turns out we are moored on the same pontoon, just three berths away from each other. We will meet up again tomorrow. 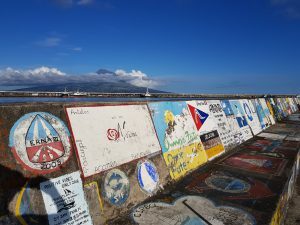 Then on Saturday I plan to set off back to the UK and they will cruise the islands before making their way to the Canaries before winter comes to the Azores – which it does with a vengeance. “You like fishing?” asked the man on the quay at Calheta. Then he thought about it. Evidently that wasn’t quite what he meant. “You like fish?” That was better. Yes, certainly I like fish. However, I was a bit tired of fishermen, having been roused twice in the night to shift further down the quay at this tiny Azorean harbour in order to make room for the two fishing boats from Madeira which had called for an overnight stop and to top up with water. Fishing boats use an inordinate amount of water for their icemakers. Indeed, part of my night was spent feeding a line from their boat, outside my boat, to the water tap opposite so they could haul their hose across – and as far as I can tell the two of them had it running all night. And here we were at eleven O’clock in the morning and it appeared to be still running – and if I was going to get a beer in the Café Sport in Horta tonight, I ought to be leaving. The fisherman motioned me to come with him which meant scrambling up a chain onto a huge cylindrical rubber fender and thence with a heave like exiting a swimming pool, onto the quay – not dignified but then the quay was designed for vessels considerably bigger than Samsara. By the time I made it to the fishing boat, the skipper – for he appeared to be the skipper – emerged with a tuna to feed a family of ten. Here I patted my very small stomach of which I am inordinately proud. Back on the boat, I looked at the size of the fish again. Then I looked at the size of my fridge – which is only ever used for beer and the occasional left-over if the engine is running or the sun shining long enough for the solar panel to keep it going – or if we happen to be bowling along at five knots and the water-generator is doing its stuff. 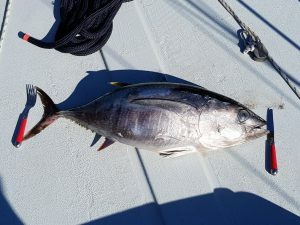 There was nothing for it: The fish would have to be butchered then and there – and I wasn’t going to do it on the boat. I’ve seen how much mess you can make with a mackerel on a boat. This monster was going to bleed everywhere. Not for the first time, I thanked Dr and Mrs Franklin, Samsara’s owners back in the 90’s who made such clever modifications as turning the top of the engine casing into a massive, removable chopping board/cup holder. It turned out to be just big enough to chop a baby tuna into the three biggest tuna steaks I have ever seen. Honestly, these were massive. 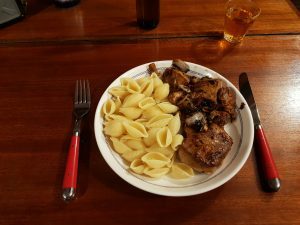 Each one would feed three people – but I didn’t see the point in having any more. It wasn’t as if I had a freezer like Bill and Laurie aboard Toodle-oo. I met them in Ponta Delgada – but they were from the USA and had a freezer (actually they had their own washing machine because Laurie didn’t trust marina launderettes – I hadn’t liked to mention my bucket). Anyway, clambering up and down for a bucket (the laundry bucket now on fish-gutting duty) and waving goodbye to the fishermen who finally reeled in their imprisoning hose, we set off – Samsara, the fish and me – for the 25 mile trip to Horta. You see, I am in the Azores and so is The Azores High. This is the meteorological phenomenon which we hear about so much on the British weather forecast because of the effect it has on the British weather. 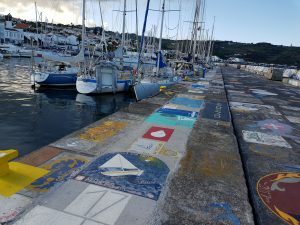 Out here it just means the wind doesn’t blow – and if you happen to be becalmed half way up the Sao Jorge Channel which is 40 miles long but only ten miles wide and full of all manner of traffic, that is just plain stressful. The second steak for dinner caused a bit of a problem: I had looked up recipes and had settled on baking it in foil with lemon and capers to an accompaniment of pasta and green beans. Duly arriving in Horta (a lifetime ambition incidentally) I set off to walk around town following Google Maps in search of a lemon. How can a whole town – in a region famous for its pineapples – not possess a single lemon? I tried three shops including the big supermarket. In the end I made do with a lime. This would not have been so bad if, becoming obsessed with lemons, I had not forgotten about the green beans … then excavated the kitchen foil only to find it had amalgamated itself into a solid block of aluminium. The frying pan came out again. I don’t mind telling you that I was not looking forward to tuna steak for breakfast. It had seemed like a good idea while enthusing over tuna with capers and lime (and a massive slug of soy sauce) but with the heat already building at eight O’clock in the morning, a few slices of water melon did seem appealing. I do have a confession, though: I kept back half the last steak. 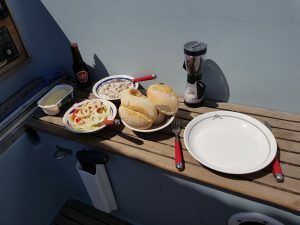 It’s cooked now – and with the fridge hooked up to the marina electricity, it should keep long enough for a tuna mayonnaise sandwich. Well, the fish has finally gone. 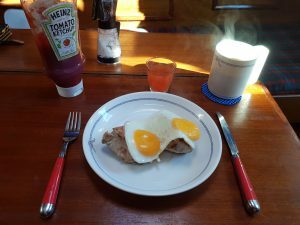 I couldn’t face it again last night – in fact I couldn’t face any more protein at all. What I really wanted was a huge plate of green vegetables (and would you believe I couldn’t find any fresh green beans anywhere – had to eat a huge pack of frozen). You expect some things to change in 30 years – it’s just a surprise when they do. The last time I visited Vila Island off Vila do Campo on Sao Miguel in the Azores was in 1987. 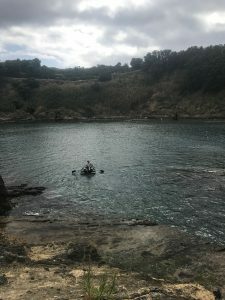 With a couple of other competitors in the Azores and Back Race from Falmouth, we took somebody’s boat the ten miles down the coast from Ponta Delgado and had a picnic in this crater of an extinct volcano. I remembered it as an amazing place – you had to anchor outside and then take the dinghy through an entrance no more than ten feet wide into a perfectly circular lagoon. There was nobody else there, the water was warm and clear – quite simply it was like something out of this world. So, obviously when the family flew out for a week to join me in Ponta Delgado, I was determined to show it to them. We sailed – the five of us, which seemed quite crowded aboard Samsara – the two hours along the coast and there, just as I remembered it was the island. Actually, that is part of the problem. The island is now a nature reserve and, after making two trips in my very small dinghy to drop my passengers, a lifeguard rushed over waving his arms and blowing his whistle to tell me that I could not enter the lagoon with a motor even if I wasn’t using it. After a bit of shouted negotiation, it was agreed that if I took the motor back to the yacht, I could row into the lagoon and haul the dinghy up onto the rocks. Unfortunately, by the time I had gone to all the trouble of doing this, the lifeguard had spoken to his boss and, if I wanted to land and join my family for a swim, there were only two ways I could do it: Either (a}: Go into the local harbour and hire a kayak (which of course would mean I couldn’t take anyone else with me) or (b): Take everyone back to the yacht and pay to moor in the local harbour, then buy five tickets for the excursion boat. In the end I returned to Samsara and sat in the sun reading a book until summoned by mobile phone to pick up the shore party – after all, I’d seen this place once already. It was only later, talking to the owner of our Airbnb apartment that one other piece of the jigsaw puzzle fell into place: Vila Island is now a nature reserve and visitors are limited to 400 a day – which means that in high season like now you have to book several days ahead. I suppose we should consider it a small victory that on this particular day, there were 404 visitors. What do you do in a calm? This calm has lasted for 18 hours – so far. It is 1145 and I am sure it started before 1800 yesterday. I’ve decided that I like calms. There is absolutely no point in getting worked up about them. I cannot make the wind blow and there is no point whatsoever in trying to motor through them – that might work if my destination was ten miles away but currently it is 760 and with a full tank Samsara’s range is only 150 miles. So, you might ask: What do you do in an 18-hour calm? The first priority was some music. I had no idea how much I would miss it but it seems I allowed my phone to go flat and when I charged it up again, Spotify required me to log in again – for which, of course, you need an internet connection. I deliberated all day about this. 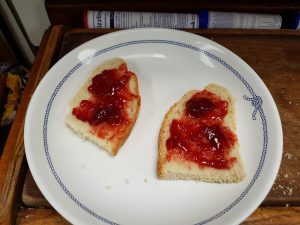 I do have an Iridium-Go which gives me satellite access – both to summon help should I need to but also to send blog entries to my son Hugo who is paid £2.50 a time to post them. Theoretically, I should be able to use the same connection to log into Spotify. I tried a couple of times but, mindful of the $1.25 a minute charge, I didn’t try for too long. To console myself, I got out the clarinet and played Stranger on the Shore and Londonderry Air but Basin Street Blues sounded terribly forlorn without Louis Armstrong’s Hot Five to play along to. Then it was time for a cup of tea and a Penguin biscuit. I found that using small tins of evaporated milk caused a terrible mess. In the rough weather of the last few days, I had ended up keeping the can inside a mug so at least I wouldn’t lose the spilt milk. However, that meant the only way to get the can out of the mug was to upend the whole thing – with predictable consequences. Next, I folded a piece of kitchen roll lengthwise and used that to lift it out – but all that happened was that the paper got soaked and disintegrated so not only did I have to upend it all again but I wasn’t even able to use the spilt milk. Of course, after an hour of something like that, I had to return to my own novel-in-progress. Having written one before, I know it’s not as easy as it sounds and I know the process: Just keep writing. Up until now it was all by hand in a blue ring-binder but now I decided I didn’t like the central character – he seemed like a bit of a wimp so I started adjusting him. After covering several sheets with circled paragraphs and arrows pointing in all directions, I remembered how I used to do this: With a pair of scissors and glue. Seeing the film Trumbo, I realised that I was not the only one. Now of course, with Microsoft Word, none of that is necessary. However, I’ve discovered that writing directly onto a laptop is not as easy on a small boat as it is at my desk at home. I tried putting the laptop on the chart table but that faces forward, meaning I have to brace myself sideways against the lurching of the boat and the mouse keeps running away of its own accord – I have to disable the touch pad because I keep touching it and the cursor disappears Lord knows where. So, instead, I sit on the windward berth with my feet braced against the leeward with the laptop where it is designed to go – on my lap. Of course, this means I can’t use the mouse and if I disable the touchpad, every time I need to get the cursor out of the document, I have to enable it again. Well, now I am pleased to report that I have trained myself to keep the heels of my hands on the computer either side of the pad without touching it while my fingers dance across the keys ((I am a touch typist these last 50 years and, as you can tell by the length of this, dancing fingers involves no effort at all). 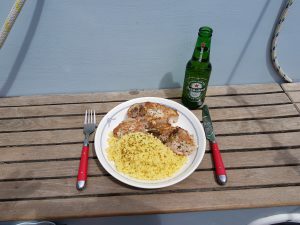 Once that was sorted, it was time for dinner – the other half of the tin of tuna with sweetcorn. I sweated half an onion with it and added a stock cube to the rice. 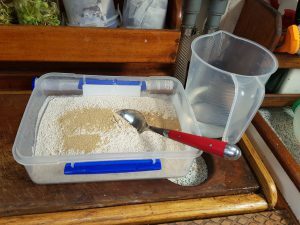 This cheap easy-cook rice needs much more water but I cut it with 1/4 with seawater and anyway I’m only using three litres a day. Follow that with cucumber and sprouted mung bean salad (always two jars of beans on the go – think I might start a third) and tinned peach slices with as much evaporated milk as I can get into the bowl now I’ve discovered that powdered milk tastes just as good if you let the tea cool or add some cold water first. Dinner was taken, as usual, at the chart table with the Kindle and Mr Dickens propped up against the compass (to hell with the deviation). I find I don’t miss a glass of wine if I have cold herbal tea instead – using the ship’s mug that Tamsin gave me and I didn’t think would be very practical. It’s made of china and I thought it would get broken in five minutes. But now I think it’s one of the best things on the boat. It’s a pain having to hang onto your drink all the time in case it spills. Wash up in salt water (but rinse the cups and coffee pot with fresh) then wonder about taking the sails down. They’re slatting away as the boat rolls but they are propelling us in the right direction – albeit very, very slowly. Decide to leave them. OK, so anyone going nowhere like this would need cheering up. So, how about rewarding myself with a Movie Night. I have about a dozen DVDs and a tiny player which plugs into the laptop. The Bluetooth speaker (no defunct with no music) plugs into the earphone socket and, arranging both sleeping bags into a sort of chaise longue, I watched the RomCom Wimbledon – probably seen it a dozen times but my daughter Lottie and I agree that if you really like a film, you can watch it again and again and always get something new out of it. There were a couple of intermissions to check for shipping and see if the wind had sprung up. Also, it seemed appropriate to have a small glass of grog – after all, it seemed that the chances of having to rush about on deck were next to miniscule (anyway it was a very small glass). And so, to bed with the two timers set for 90 minutes – which of course turned out to be pointless since this part of the North Atlantic seems particularly deserted and, no, the wind did not return. Awoke to rain – and still no wind. Went back to bed. Finally, when it stopped raining at about 0800, I got up and took the sails down. We were now going very slowly in the wrong direction and there was not enough wind flowing over the windvane to correct this. Breakfast – made the night before – oats, sultanas and powdered milk allowed to soak overnight. Started the last apple. Chopped it up into tiny cubes to go on top. Perfectly all right, should have bought more. Take a wide, flat two litre plastic container. 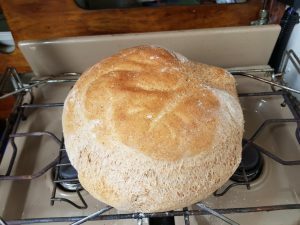 Half fill it with strong bread flour. Add two teaspoonfuls of dried yeast. Make up half a litre of water including one quarter seawater. Add the water gradually and mix with a metal spoon to a dough. Do not put your hands in it until you can do so without the dough sticking to them. Light the oven and put it on the lowest setting. 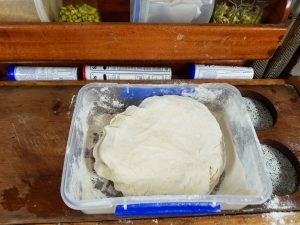 Knead the dough in the container for ten minutes, adding more flour when it starts to stick to your hands. Put the dough on a metal plate and into the oven to rise for ten to twenty minutes depending on the heat of your oven. When it seems to have stopped rising, scrape it back into the plastic container and knead for a further ten minutes. While you are doing this, have the baking tray in the over to warm. After kneading the dough a second time, shape it into a ball and coat it lightly with flour. Sprinkle some flour into the baking tray. This will stop it sticking. Do not grease the tray. Return to the oven and allow to rise again. This time, when it seems to have finished rising, turn up the oven to the maximum setting and bake. Check the colour after 20 minutes and then at five-minute intervals. When it seems to be the right shade of brown, remove from the oven, turn the bread out of the baking tray and allow to cool on a wire rack. …and at last, at 1800 I can report that the calm is over. After lunch of fresh bread, corned beef and pickles with mayonnaise and HP sauce, I decided that enough was enough. The wind was fluctuating between three and five knots from the starboard quarter (or what would have been the starboard quarter if we had been pointing in the right direction) so I hoisted the cruising chute on its own and sat there steering by hand. After a while I reckoned I had the measure of things and carried on with the Pickwick Papers while steering. And finally, after an hour of that, I went below and spent the next hour sewing the frayed edge of the ensign – and we were still on course when it was done, slipping gently over a flat sea at about three-and-a-half knots in the direction of Sao Miguel. The little black box is indeed about the size of a pack of cigarettes – a little bigger, maybe – but a marvel, nevertheless. Well, it’s not a walkie-talkie but, being effectively a Satellite phone, the Iridium-Go can get me onto the internet from anywhere in the world. I tried it from the back garden at home and then used it last week to send four blog posts for my son Hugo to upload. It took nearly 40 minutes by the time I worked out how to do it. Now all I need to know is: Does my $40 a month cover 7KB of data or am I paying $1.25 a minute regardless? This is urgent because, although the wind has veered today and we are charging off in the right direction at five knots, the towed generator spinning like a mad thing and the ETA suddenly shunted forward to next Tuesday, that is still a week away. “Can I survive a week without music? Spotify is on my old phone along with some 200 songs – everything from Van Morrison to Willie Nelson. And How am I supposed to practice the clarinet without Humphrey Lyttleton’s Bad Penny Blues to play along to? It seems that I allowed the phone to run down and, when I charged it up again, Spotify expected me to log back in – but how am I supposed to do that from here? Won’t you get bored by yourself for all that time? Well, if there was a day to get bored it was yesterday. Want to know how much progress we made? 17 miles. At this rate the two-week voyage is going to take two months. But from the very first (three O’clock in the morning) it looked as this was going to be a day of going nowhere. In fact, for pretty much the whole day, the sails were furled, Samsara rolled through 500 in a snappy two seconds and it might have been fairly easy to sit wedged at the chart table and grumble. Yet, somehow that doesn’t happen out here. We’re now five days out in the Atlantic – it’s three since I’ve seen a ship. I did pick up the world news from a short wave station in Thailand (Did I hear right, Boris Johnson has resigned over Brexit?) But essentially, this a bubble. The world has shrunk to 31ft 10in x 8ft 9in. Time is measured not by the clock but by mealtimes. So, what can I remember of yesterday? I do remember taking off all my clothes and wandering around the boat in the buff. It felt wonderful – until there was a creeping sensation of parts of me beginning to burn. Since a bit of maintenance gets done every day, this was clearly the occasion to tackle a really fiddly bit of wood-stripping. It took nearly three hours, feet at awkward angles, braced against the incessant rolling but with a bit of inventiveness (including a Conwy District Council library card to protect the instruments from the sandpaper), I managed to get it all done – and earned the reward of a corned beef sandwich with mayonnaise, pickles and HP sauce. And I’ve started to write another novel. Ever since publishing the one from the attic on Amazon (see the tab above) felt this nagging urge to do a second. Would really like to know if I’m any good at it – especially sinc eNumber Three Son Owen graduated from the University of East Anglia’s Creative Writing course. He has a whole lifetime ahead of him to make his mark as a writer. I seem to have spent mine producing reams of journalism which somehow doesn’t seem to count as a legacy in quite the same way – although if you’re looking for a real journalist I can still quote you Vincent Mulchone verbatim. So, out came the blue folder with its blank Sainsburys Low Price A4 ruled refill pad and now the first of its 200 sheets contains a basic plot. Without any apparent effort, this was followed by a handful of characters (all pinched from real life – mustn’t forget to add that bit about “any resemblance to persons living or dead”). I’m going to do it the right way this time as well – first chapter and synopsis. Last time I wrote 108,000 words before I sent it to anyone – and they wanted it cut to 60,000. It’s only if you have children that you can name your favourite colour – after all, who else asks? I used to paint my bedroom yellow so that it would be like waking up with the sun shining even if it wasn’t. Back in the days when I thought I was going to be retiring rich and having my perfect boat built to order (38ft steel cutter) she was going to be called Shansi with a little painting of the Chinese Womble on the wind vane. I used to ghost-write Womble stories for Elisabeth Beresford who wrote the books. That’s how long ago it was. And Shansi, the boat, was going to be bright yellow. Yellow hull, yellow decks, yellow mast – and caramel-coloured sails. Quite apart from the advantage of being somewhat noticeable, the good thing about a yellow steel boat was that the rust streaks would look quite attractive. Well, plans are made to be changed and Samsara has a white hull and grey deck (not the right shade of grey but that is another story – and rather a tiresome one). So, what was all this yellow I’ve been finding today? About a hundred miles west of Ireland, the wind has been light all day and finally died away to nothing – well, not really nothing; I’m sure a lightweight racing boat with a full crew would have kept moving but Samsara is no lightweight and I draw the line at sitting up at the helm all night for the sake of putting on extra knot. Instead, I took everything down, shut the hatch and went to bed with two alarms leapfrogging each other. It was the four O’clock alarm that was just in time to show the little boat icon on the plotter actually moving – but in the direction of Newfoundland instead of the Azores. That’s what you get with a windvane: The wind changes – and so does the heading. In the normal course of events – four O’clock being somewhat before breakfast – I wouldn’t be up to doing much more than re-setting the steering. 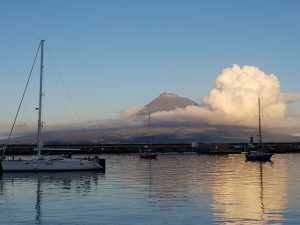 But this voyage is a bit like being in a pursuit race: The family arrive at Ponta Delgada at 1825 on August 1st and progress yesterday didn’t leave much leeway. So, pulling on foul weather gear over my pyjama shorts (clammy but convenient), I started crawling around the dew-covered deck setting sail which is not as easy when you’re pointing in the wrong direction and don’t want to start the engine because you’ve cranked so much grease into the stern gland it would be a waste it to turn the prop shaft. Strange to think of this as progress but it definitely warranted breakfast in the cockpit. Now, if you have looked at the “Good Health” page on this blog, you will see that the only reason I am able to do all this at my age is because of my collection of natural supplements (I don’t carry any pharmaceutical products at all – not even paracetamol). One of these supplements is a water-based curcumin (usually it’s only soluble in fat which means you have to cook with it to get it into your system). Mine comes in a little plastic capsule – slightly fiddly to pick out of the pot if you put everything in there together. If I had known what was going to happen next, I would have been rather more careful about making sure I picked up everything – that I didn’t leave any capsules there to get squashed… and spew bright-yellow water-soluble curcumin into the deep, non-slip tread of my very expensive leather (not clammy) Dubarry boots. It would have been fine if I had just stayed in the cockpit – or even gone below where I could tread the yellow all over the dark grey waterproof carpet. But no, after my special (and quite delicious) cold porridge with sultanas and apple – and even a nectarine since, as usual, they had all ripened at once – it seemed that 1.56kts was no longer enough. The wind had veered some more and there was no doubt, she would carry the cruising chute. So, you can see how much activity there was – and with so much of the action taking place in the rigging, it was hardly surprising that I never looked at the deck. The grey deck (too pale by half) was now covered in random smears of bright yellow – and not just the deck (you can always scrub the deck). Every rope on the boat now seemed to be marked at intervals with bright yellow. At first glance I thought it was the manufacturer’s trademark – they haven’t made plain white ropes since the 70’s. So, I scrubbed the decks. I knew what it was. I’ve had this trouble before. Also, I knew to scrub my boots first. But then, the more I scrambled around scrubbing, the more the stuff seemed to spread. I scrubbed the boots again, kneeling in the cockpit with a bucket of Atlantic to make sure I did a good job – that just seemed to make matters worse. In fact, when I crawled up to the foredeck to unhook the jibsheet from the anchor windlass, there seemed to be more than ever when I came back. It is now evening but not yet late enough for the other half of last night’s spaghetti putanesca. Samsara is under all plain sail and making four knots in the right direction. The hatch is shut because the North wind is chilly for July and somehow it seems like it’s been a busy day. I think I’ll add the other half of Sunday night’s tin of sweetcorn. Sweetcorn cheers you up. Start putting together the perfect day and sunshine has to come high on the list. Yes, the sun is shining – just a few high clouds but they’re mostly on the horizon. In this patch of the Atlantic it is a day of blue skies. Blue skies and blue seas – that deep blue you only get with deep water and here, just south of the Hebrides Terrace Seamount, the seabed is over 2000 metres beneath the keel. And progress is on the list too – the feeling that the destination is getting closer all the time. This is where the singlehanded sailor has the advantage: He can change the destination. Yesterday the destination was causing trouble: The whole point of coming to Scotland had been to take part in the Rival Round Rockall Rally. It is 50 years since the first Rival yacht was launched and the owners’ association had the idea of marking the event by taking a number of these tough, seaworthy boats to that desolate lump of granite 200 miles out in the Atlantic which gave its name to a whole sea area of the Shipping Forecast: Rockall. In fact, only three made it to the jumping-off point in Castlebay on the Isle of Barra – and one of them saw Rockall as only a part of their “big picture” which was to circumnavigate the Outer Hebrides. This meant starting with a 25-mile detour. There was also a plan to land two people on the rock. After all, landing on Rockall is about as common as landing on the Moon. Clearly this was going to be quite an operation. It would take hours. None of which seemed to fit in with my own “Big Picture”. For me, Rockall was just a turning point to get a good angle to the prevailing winds going down the Atlantic where I was due to meet the family in the Azores. I had 24 days to do 1,500 miles – so no time to waste. Certainly, no fuel to waste motoring into the wind and tide for the detour when there was a perfectly good short cut between the islands. I told the other boats I would see them on the other side. I never did. Half way to Rockall, there was still no sign of them. Then the wind died and backed to the West. The other hundred miles might take another two days – meanwhile the other boats were loaded with fuel (one had an extra 50 litres lashed on deck). They would turn on their engines just as soon as the speed started dropping. By the time I got there the historic ascent of Rockall would history. That was when the chart for the Atlantic came out. The Azorean island of Sao Miguel lay 1330 miles away on a bearing of 2200. Let’s just try an experiment – see what course we can lay: Lift the chain off the self-steering, put the helm up, trim on the other tack. Not too close, she’ll have to look after herself… Now, what course does the compass give us? Hey, 2230 – almost a straight line to the Air BnB Tamsin booked in Ponta Delgada. So it was that sunset found me standing in the companionway with a can of Green King IPA (cool from the beer locker in the bilges) watching the windvane tracking us into Irish waters when there was a sigh close by. It was a sound so familiar – a reminder of a life which is returning in almost every detail. And there, just off the quarter, so close as to be practically within reach, were two pilot whales surfacing – as they always seem to – so close together that they might have been joined at the hip. Within five minutes there were a dozen of them spread out astern, in two’s and three’s – their blunt, jet-black heads breaking out of the white crests, the air filled with their explosive sighs. One group of four curled again and again, pressed together so closely, they appeared as one. They couldn’t have needed to breath that often. I think they wanted to look at me. When had I seen this before? When was the last time I was alone in a boat embarking on an ocean crossing? I worked it out – 27 years ago. And yet everything was the same – as if no time had passed at all – as if these were the same friends come to check up on me as they might periodically just to see all is well. And then something peculiar happened. One of the whales broke away from the others. That was odd, to see one swimming alone. Then suddenly it leapt right out of the out of the water – not high in the air like a dolphin or doing a somersault or anything. But it did turn right over on its back. I could see its pectoral fins quite clearly as it splashed back into the water. Again and again this one whale performed its manoeuvre immediately astern while the others continued to rise and fall on either side. It might be fanciful but was there some sort of communication going on here? Because there are more accounts of whales and dolphins appearing to communicate with sailors than you can imagine. In which case, I like to think that what this one way saying was “Welcome back”? And, yes, it’s great to be back. I am sitting in a bar in Ponta Delgada, in the Azores waiting for Tamsin to arrive with the youngest two children. 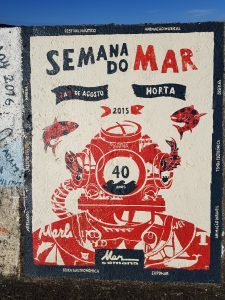 They have landed, apparently and will be arriving at our Airbnb apartment whenever the charming Portugese bureaucracy has finished with them (it is charming, very good for the patience and helps keep lots of people employed). When they do arrive, I shall be seeking an explanation from 15-year-old Hugo as to why nothing has been posted on this blog since the Hebrides. But nothing – nada, niente… an aching void.